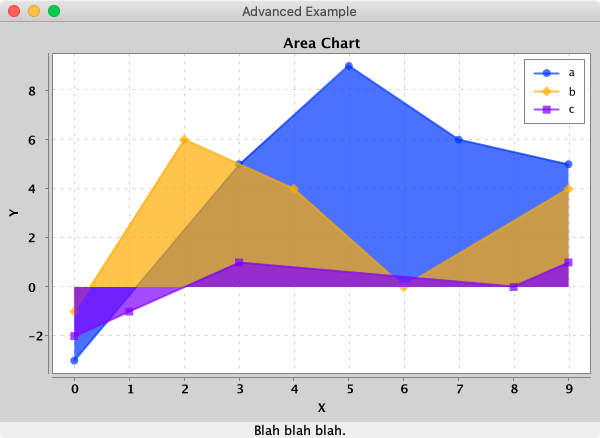 XChart is a light weight Java library for plotting data. 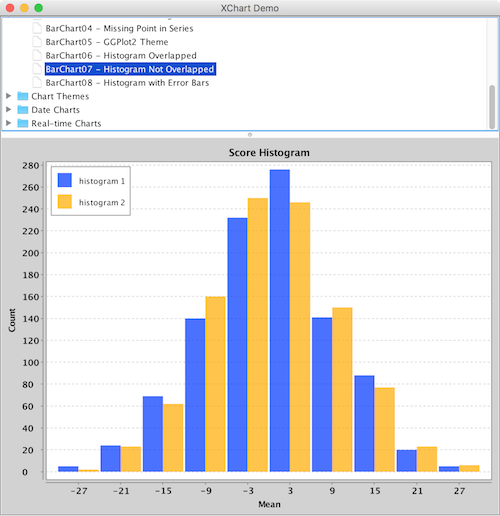 XChart is a light-weight and convenient library for plotting data designed to go from data to chart in the least amount of time possible and to take the guess-work out of customizing the chart style. 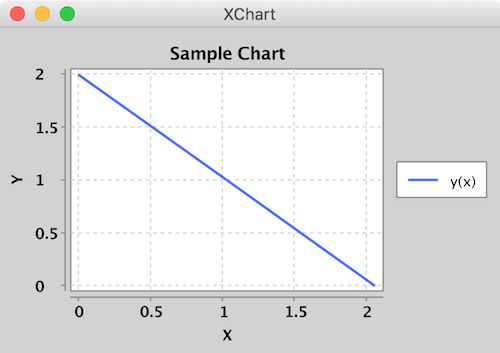 Create a XYChart instance via QuickChart, add a series of data to it, and either display it or save it as a bitmap. Create a XYChart via a XYChartBuilder, style chart, add a series to it, style series, and display chart. 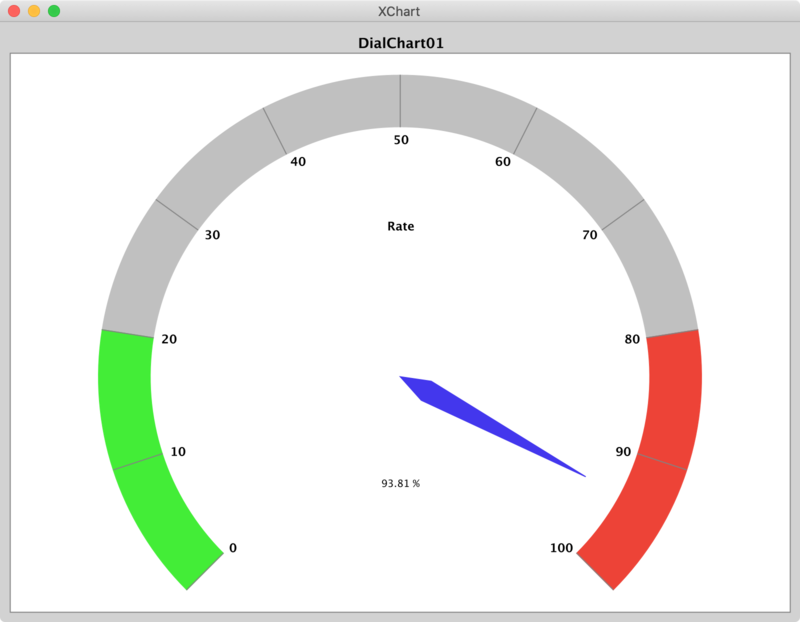 Create a XYChart via a XYChartBuilder, style chart, add a series to it, add chart to XChartPanel, embed in Java Swing App, and display GUI. To make it real-time, simply call updateXYSeries on the XYChart instance to update the series data, followed by revalidate() and repaint() on the XChartPanel instance to repaint. Currently, there are 5 major chart types. Each type has its corresponding ChartBuilder, Styler and Series. The different Stylers contain chart styling methods specific to the corresponding chart type as well as common styling methods common across all chart types. XYChart charts take Date or Number data types for the X-Axis and Number data types for the Y-Axis. For both axes, the tick marks are auto generated to span the range and domain of the data in evenly-spaced intervals. Series render styles include: Line, Scatter, Area, Step and StepArea. CategoryChart charts take Date, Number or String data types for the X-Axis and Number data types for the Y-Axis. For the X-Axis, each category is given its own tick mark. Series render styles include: Bar, Line, Scatter, Area and Stick. PieChart charts take String data types for the pie slice name and Number data types for the pie slice value. Series render styles include: Pie and Donut. 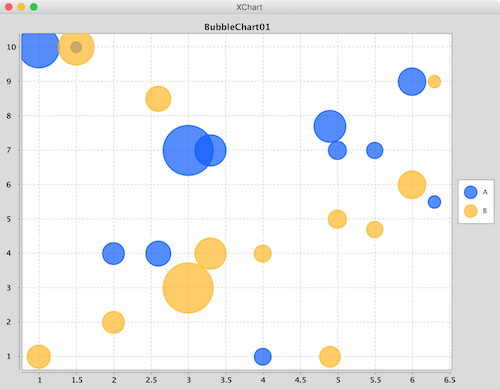 BubbleChart charts take Date or Number data types for the X-Axis and Number data types for the Y-Axis and bubble sizes. Series render styles include: Round and in the near future Square. DialChart charts take a double to set the position of the dial pointer. 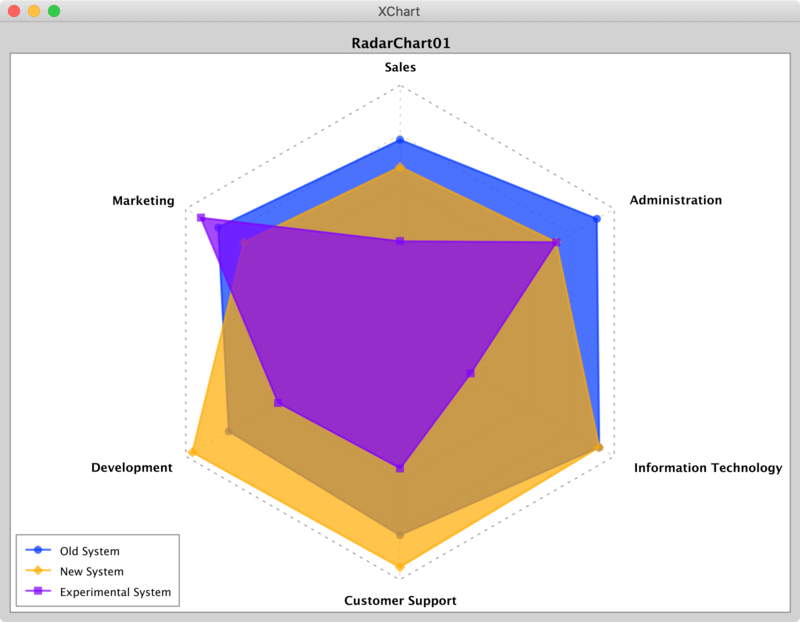 RadarChart charts take a double of values between 0 and 1 to set the position of radar node. Series render styles include: Polygon and Circle. OHLCChart charts take Date data types for the X-Axis and 4 Number data types for the Y-Axis. For both axes, the tick marks are auto generated to span the range and domain of the data in evenly-spaced intervals. Series render styles include: Candle, HiLo. Creating real-time charts is as simple as calling updateXYSeries for one or more series objects through the XYChart instance and triggering a redraw of the JPanel containing the chart. This works for all chart types including XYChart, CategoryChart, BubbleChart and PieChart, for which example source code can be found here. Examples demonstrate using the SwingWrapper with repaintChart() method as well as XChartPanel with revalidate() and repaint(). The following sample code used to generate the above real-time chart can be found here. All the styling options can be found in one of two possible places: 1) the Chart's Styler or 2) the series' set methods. With this chart customization design, all customization options can be quickly "discovered" using an IDE's built in "Content Assist". With centralized styling like this, there is no need to hunt around the entire charting API to find that one customization you're looking for - it's all right in one spot! XChart automatically creates axis ticks and axis labels. 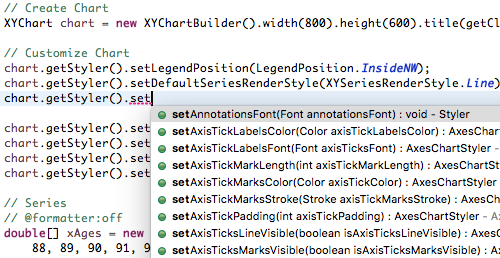 Default axis placement can be altered with chart.getStyler().setXAxisTickMarkSpacingHint(spacingHint);. x : value where the tick will be drawn (this value is in xData space, not in pixel space). For category charts x is index of the category (0 means first category). label: Tick label. If it is null, tick will be generated with a " " label. 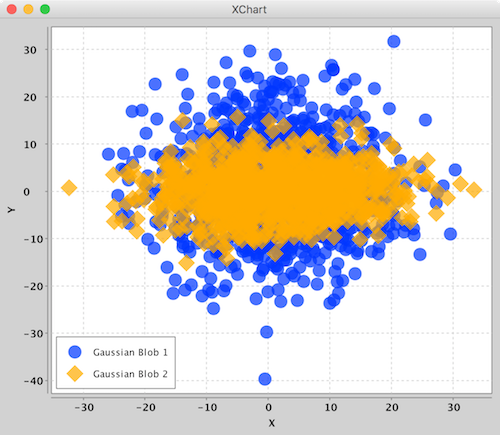 XChart ships with three different themes: Default XChart, GGPlot2 and Matlab. Using a different theme is as simple as setting the Chart's theme with the theme method of the ChartBuilder. Now go ahead and study some more examples, download the thing and provide feedback. The XChart release artifacts are hosted on Maven Central. Formats your code using google-java-format which follows Google's code styleguide. Download google-java-format-eclipse-plugin_*.jar and place in /Applications/Eclipse Java.app/Contents/Eclipse/dropins. Restart Eclipse. Select the plugin in Preferences > Java > Code Style > Formatter > Formatter Implementation. In the plugins section in IntelliJ search for google-java-format and install the plugin. Restart IntelliJ. Please report any bugs or submit feature requests to XChart's Github issue tracker.